Posted 8/23/15, and pictures taken 8/4/15. The owner died on 6/26/15 in Ben Wheeler, TX. The mother was a Blue Heeler. While we had the dogs at the man's house posted for the family to try to find homes for them, someone let the gate open to the dog pen, letting her mother and three siblings out, and her mother and one sibling were killed by something or someone. 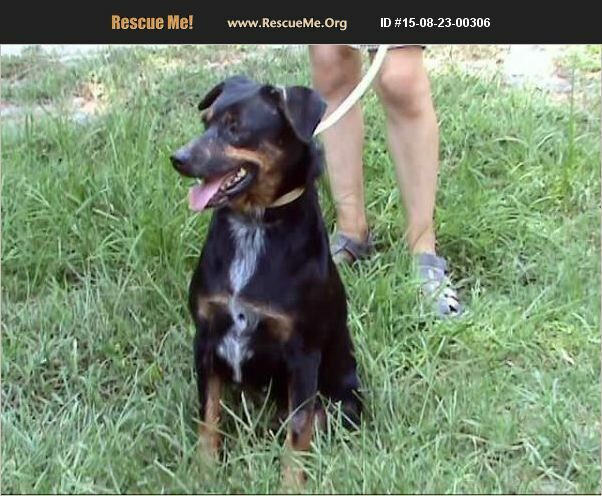 Rhea was the third one that was missing, but she was found on 7/17/15, and reunited with her sister Rayna. She can dig under a fence if she wants to, so she will need to be in a secure yard, or crated when gone. She seems to be content with her sister here now, so she may do better getting adopted with her sister. Rhea is more social with people than Rayna, but they are both very sweet and making very good progress with us. They both come up to me, and loves treats. She is estimated to have been born in 2009, and weighed 31.1 on 7/23/15.